At Softley Kitchens we fully understand the problems that most conventional kitchens can pose for disabled people, the elderly and those with special needs. Although we are sometimes able to expertly design an affordable solution using our conventional range and adapting the units to suit, the best answer is often an entirely bespoke Saint Roch kitchen, incorporating working surfaces, plinths and knee-spaces at our Customer's ideal fixed height, or utilising the latest rise-and-fall electrical technology. 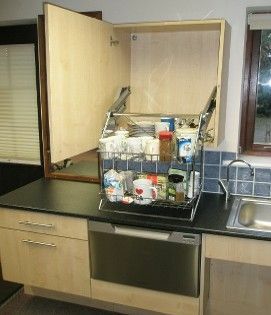 Softley Kitchens is proud to have pioneered the development of kitchens for disabled people. The Company is named after Len Softley BEM, an amputee who was heavily involved in the Stoke Mandeville Games in Aylesbury, the precursor to the modern-day Paralympic Games. Len Softley was a renowned joiner and first manufactured a kitchen for disabled friends in the early 1980s. 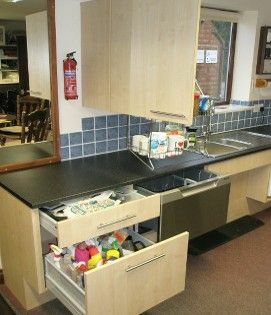 After Len retired, Softley Kitchens was formed and went on to offer disabled Customers an unbeatable choice of colours and features only previously seen in conventional kitchens. There is no limit to the design possibilities of a bespoke Saint Roch kitchen, whether it be for a wheelchair user or an ambulant Customer with special needs. And, as with our conventional kitchens, there is an extensive choice of styles and finishes. The team at Softley Kitchens is on hand to provide free, expert advice and guidance on the design of your kitchen. However, the complete design process often takes many days and, especially if you live a long way from us, we reserve the right to make an initial charge. Any charge would be discussed with you first and refunded against a resulting order. If our main range of kitchens will not cater for your needs, your kitchen can be entirely tailor-made. But it’s still worth glancing through our digital brochure to see if a particular style or feature jumps out to you. for more details about our bespoke kitchens.